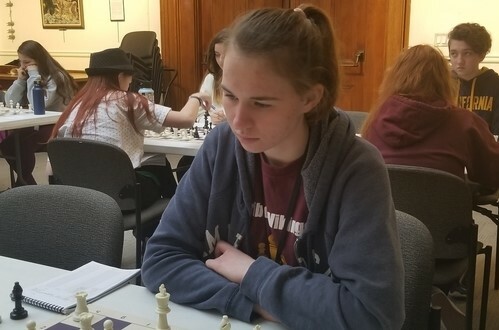 03.17.19 Caribou High School senior, Hailey Holmquist, will represent Maine at the Susan Polgar Foundation Girls' Invitational chess tournament from June 22-27 at Webster University in St. Louis, Missouri. Holmquist earned her invitation to the prestigious tournament, which selects one female scholastic chess player from each state, as a result of her performance at the Maine Girls' Championship held at the Bangor Public Library in February. Congratulations to Hailey for receiving this honor and all the best in St. Louis! Hailey Holmquist competes in the Maine Girls' Championship at the Bangor Public Library on February 2, 2019.